ROSS BARKLEY ESCAPED with just a yellow card but it could’ve been a lot worse for the Everton midfielder after an horrendous challenge on Liverpool’s Jordan Henderson in tonight’s Merseyside derby at Goodison Park. The game was scoreless when the 23-year-old caught Henderson with a late, high, studs-up challenge that left the Reds’ captain requiring treatment. Referee Mike Dean booked Barkley but the incident sparked immediate reaction from a number of players and led to Seamus Coleman also picking up a yellow card. Afterwards, Henderson was quizzed on the tackle and played it down. “I know Ross well, he’s a good lad”, he said. “I’m good friends with him. He apologised after the game it was mistimed, you get them in derby games. It’s a derby. It doesn’t matter if you’re friends off the field. On the pitch you give it 100%”. Liverpool left it late to take all three points with Sadio Mane’s game-winner coming in the fourth minute of injury-time. Email “Ross Barkley is a very lucky boy after x-rated challenge on Jordan Henderson ”. 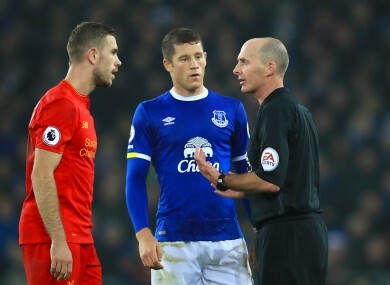 Feedback on “Ross Barkley is a very lucky boy after x-rated challenge on Jordan Henderson ”.